Lesson2: Contemporary Artists Make Comments About The World We Live In. 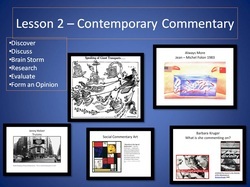 In this lesson students will discover how and why artists use their art to make comments on contemporary social issues. Through discussion and brain storming students will identify the issues that are of importance to them in their personal lives. Through researching a chosen social issue, students student understand how artists gather critical information to support their point of view as a basis for their art creation. After formulating an opinion, and gathering information to support point of view, students will create their own social commentary artwork. · Artists create to illustrate individual and collective view points. · Art can raise awareness to social and political issues. · Art can instigate change in personal and public arenas. · Artists have a role in documenting and shaping society. · What makes an artwork a commentary rather than just a documentary of an event or social issue? · What are the social issues in contemporary society? · How can artists use their art to make comments on social issues? · How can artists use their art to bring about social change? · What role does the artist play in shaping society? The teacher will recap the previous lesson as a lead into discussion contemporary artists and their social commentary artworks. The teacher will lead a class discussion about the artworks selected for this lesson. What do all these artworks have in common? Which works are personal and which are political? When were these artworks created? What was the social/political climate at the time these works were created? What media is used in the artworks? Would the artworks be more or less powerful if a different media were used? Which artworks do you think had more impact on the mass public? Students will break into small groups to brain storm and create lists of what they perceive as important issues in contemporary society. Students will articulate what issues are prevalent in the following categories; Social, Political, Environmental, Economic, Local and International Communities, and Their Personal Lives. In a large group discussion students will compile the individual group lists into one class list of identified issues. Students will choose an issue that they would like to create a commentary artwork about. Students will begin to individually brainstorm aspects of their chosen issue that they want to focus on. Students will conduct individual research to gather credible information supporting their point of view. Students will evaluate found information as to its applicability to their art making process. Students will document the information they found and their sources in the form of a word document to be reviewed with the teacher. ** Liberman,W.S. (Ed.). (1990). Folon's folons. New York, NY: The Metropolitan Museum of Art. Formative assessment may be used through observation of student contributions to small and large group discussions of artworks and articulating current issues. Summative assessments may be used to evaluate the effectiveness of individual student research. Students are to be given a rubric to help them self monitor the collection of information. "A" Student point of view and artwork goal clearly stated. * Source (4 or more) found are credible and informative. * Knowledge gained from source is clearly written and support student's point of view. "B" Student point of view and artwork goal are not clearly articulated. * Sources (at least 3) found have some credible information. * Knowledge gained from sources is vague or does not appear to support the student point of view. "C" Student point of view and artwork goals are vague. * Sources (at least 2) found have credible information. * Sources linked but not cites in MLA format. * Limited knowledge gained is documented. "D" Student point of view and artwork goal are not clear. AIV.13 - The student will use an extensive, high-level art vocabulary to analyze, evaluate, and interpret works of selected artists. AIV.14 - The student will describe where, when, and by whom specific works of art were created. AIV.16 - The student will identify the influences of selected artists on society and culture. AIV.20 - The student will use an extensive, high-level art vocabulary related to design, composition, aesthetic concepts, and art criticism when discussing works of art. AIV.24 - The student will demonstrate the ability to conduct an effective critique. AIV.25 - The student will critically view the quality and expressive form of works of art as a source of inspiration and insight and as a potential contribution to personal works of art. AIV.30 - The student will justify personal perceptions of an artist’s intent, using visual clues and research.